Goddard, Stephen H. and James A. Ganz. Goltzius and the third dimension. Exhibition catalogue. Williamstown: Sterling and Francine Clark Art Institute, 2001. Leeflang, Huigen and Ger Luitjen, et al. Hendrick Goltzius (1558-1617). Drawings, Prints and Paintings. Exhibition catalogue. Amsterdam: Rijksmuseum, New York: The Metropolitan Museum of Art, Toledo, Ohio: The Toledo Museum of Art, and Zwolle: Waanders Publishers, 2003. 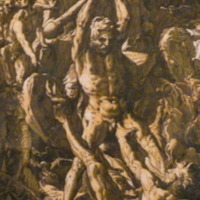 Hendrick Goltzius (Dutch, Mühlbracht 1558–1617 Haarlem), “Hercules and Cacus,” Mapping Mythology: A Digital Collection of Classical Mythology in Post-Antique Art, accessed April 22, 2019, http://www.mappingmythology.com/items/show/87.